Am I doing this pose right? Is there more to yoga than just the poses? What are the benefits to the different breathing techniques? I’d like to take my yoga practice to the next level. I wonder how I can take my yoga practice off the mat and into the rest of my life. I might like to teach yoga. If you have had these questions and are thinking that you might want to deepen your yoga practice and/or possibly teach yoga, then you are probably beginning to realize that there are many in-depth yoga study and teacher training programs available, which can make it challenging to determine which option is the best one for you. In the video here, I offer some vital factors to consider in your decision making process before making such a worthy commitment to your emotional, physical, and mental growth. I offer, along with my teaching partner, Denise Manandik, an in-depth yoga study and basic 200-hour teacher certification training through the Huntington Beach-Irvine CA School of Cloud Nine Yoga, a Yoga Alliance Registered School owned by Erika Faith Calig. I have been one of the Senior Yoga Teacher Trainers for the Cloud Nine Yoga Huntington Beach – Irvine School since 2007 and feel blessed and honored to guide yoga students in deepening their yoga practice and support them in becoming yoga teachers. It was my own personal experience with, and passion for, yoga that inspired me to share its healing power (inside and out) with others as a yoga teacher and consider my own in-depth yoga study and teacher training through Cloud Nine Yoga to be the best gift I ever gave myself! What makes Cloud Nine Yoga’s program special is its respectful, supportive, and gentle guidance to promote growth, healing, and transformation, while maintaining a focus on safety in body, mind, and spirit. The spiritually-focused approach creates a welcoming and compassionate atmosphere that empowers students to find their authentic voice, reconnect to their true nature and purpose, and become a part of a community of like-minded spiritual beings having a human experience. 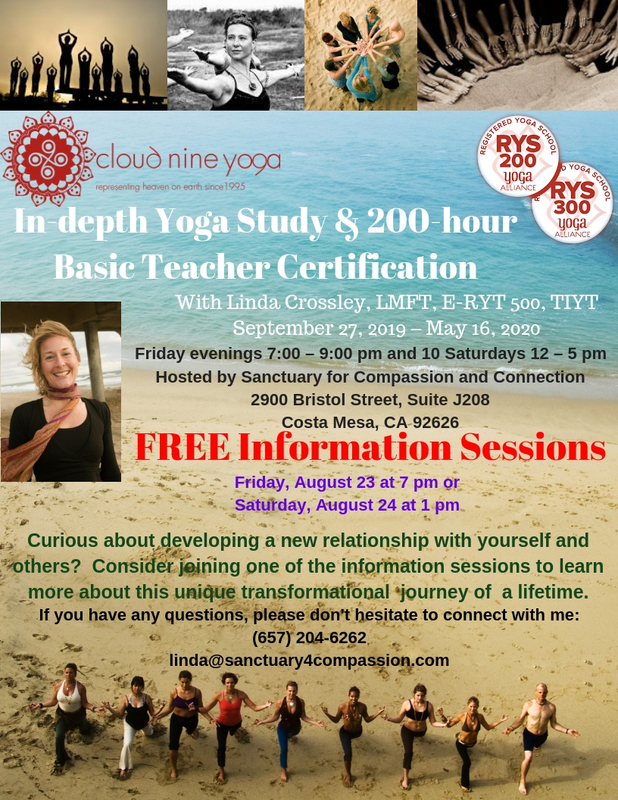 For more information on how the program breaks down, including subjects covered, as well as the required fees and the specific dates of the next training, please feel free to connect with me, visit Cloud Nine Yoga, or click on the below for more details. Click the link above and download this form first. Save As a new document on your computer before completing it. After you complete the form on your computer, email it to linda@sanctuary4compassion.com.